Here's a perfect note for this day of egg-bearing Leporidae. 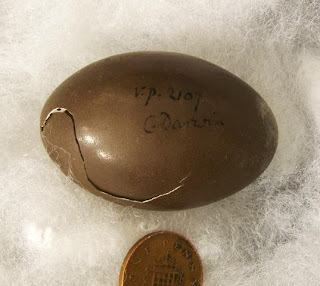 The University of Cambridge's zoology museum has come across a long-forgotten egg that Charles Darwin collected during his famous voyage on the Beagle. The 4.7-centimeter-long egg (left), from a partridge-like bird, is cracked: "The great man put it into too small a box, and hence its unhappy state," according to records found with it. "It's the only egg that we know for sure was collected by Darwin," even though he collected eggs and nests from at least 16 types of birds on his travels, says museum Director Michael Akam. The egg was rediscovered when the museum's egg collection, which has lain uninventoried for a century, was being catalogued. It was from what was then known as the Common Tinamou, now the spotted nothura or Nothura maculosasa.